I have been almost relentlessly positive about my training progress. This is in part because progress has been rapid - I had (and still have) weight to lose and strength to gain, therefore any structured plan would show an improvement. It's also in part because I try to take a positive approach to everything I do - I find that if I can remain positive and focused about training that transfers directly to other areas of my life. I've found it's important to have a mental strategy to deal with alterations to the training plan as it can become a problem if that level of positivity hinges on each session being completed succesfully. This week the weather has been very warm in the UK. I'm a big fan of summer, I love the sun and being outside on my bike or (now I'm a bit lighter) even running. It does take a few days to adapt to the overnight temperature though - as a result this last week I've had three consecutive nights from Wednesday to Friday night of very broken and unrewarding sleep. This peaked on Friday when I'll wager that I got no more than 30 minutes uninterrupted sleep at a time. Not only nowhere near enough sleep, but definitely not enough to sustain a heavy training load. Saturday was due to ba a long and hard day, challenging at the best of times. Up at 4am, pick up Danny Norman (go and download The parkrun Show now) and drive to Marple in Cheshire for their inaugural parkrun, drive home. Sleep for 3 or 4 hours. Get up again, cycle up to Clapham and meet some work colleagues at 11pm for the London to Brighton Night Ride - and, in order to make it a real Ironman-worthy training session - cycle back home afterwards. Marple parkrun was gorgeous. A challenging undulating course on a beautiful hot early-summer morning. I met some great people including Tom Williams and his wife Helen and daughter Rosie, Tom is a presenter on Marathon Talk (grab it from iTunes) and UK Manager for parkrun. David and Sharon Rowe who have been involved in the parkrun community for many years; and James, Marple parkrun event director, and his crew. I even got to say hi to Tony Audenshaw, who I know as the voice of Tony's Trials in Marathon Talk, but is apparently better known as Bob from Emmerdale. We had a lovely coffee afterwards at sleepy coffee shop and bakery Libby's in Marple Bridge - I'm not sure they knew what had hit them! As I was driving back yesterday early afternoon I knew something had to give. I was absolutely shattered, only a Grande Filter from Starbucks and Danny's chirpy chatter kept me focussed enough to get home. I collapsed onto the sofa and was micro-sleeping almost immediately. Regrettably, I had to call the night's 180km mega-ride off. I have a real problem with people who promise to do things, and then don't show up - it's a behavioural trait that winds me up, particularly when others have gone out of their way or might be looking forward to your presence. I try very hard not to be that person so missing the ride was not a decision taken lightly. Would I enjoy cycling 180km (if indeed I made the distance) in a catatonic haze? Would it make me a better Ironman? No on both counts, and it would have a negative impact on my adaptation of the week's productive load. I ate well yesterday afternoon, made an effort not to nap, and turned in at about 11pm in the end. I slept solidly until 9.30am today - a sleep that gave me far more training benefit than the ride would have done. So I'm sorry I missed the ride, I hope the guys that did it had an awesome time, but for me - my night's training was spent dreaming and recovering. It was a positive decision, it was the right thing to do. I rode 120km on this cassette the other week, back to home from Northampton parkrun. I tell you what, it's damned infuriating! The lesson to learn: No matter how many times you've done something, check it! Can you imagine racing on this? I'd be ready to throw my bike off a bridge just like David Millar did by the time I'd finished. Still, at least I'm not leaping through thorny doom like my Mrs. Sometimes a training session is just not fun. Crap weather, niggling injury, head not in the right place - but you go out anyway, and you get the job done. It might not be the best day ever but the session was done and the time is "in the bank" - you'll benefit from the training and it'll contribute in some small way to your improvement. Today was not one of those days, in fact I felt damn-near invincible. The day called for a long ride, and a short run at 90% max effort (how convenient for that most parkrun blessed of days, Saturday). I decided to head up to St Albans parkrun. It's near enough that I can ride there without a crazy early start (I've been sleep deprived enough this week as it is), and it's not a course I've done before. I also needed to do some hard effort periods, 3x 10 minutes well into HR Zone 2. I decided on taking a long route back, and riding the last 10 minutes of every hour at high intensity. 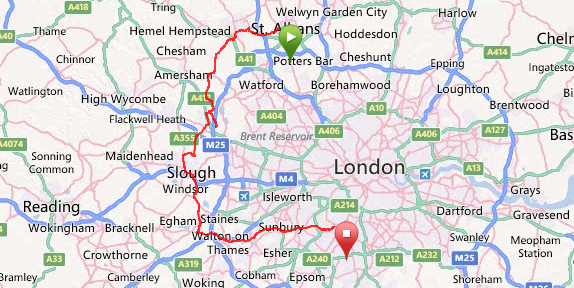 The ride to St Albans was uneventful, apart from some GPS woes. My watch lost about 10km of the route - oddly retaining HR data for the period, but no position. Following that my Garmin Edge 705 which I've recently rediscovered and now plot all my routes into in advance, took 2 reboots to find any satellites. Maybe it was a bit foggy up there in low-orbit land today. I found the park and got changed. For once I'd arrived in good time, and had a chance for a snack and drink and warm-up jog (I was already fairly warm after an hour and 45 minutes of cycling, but you still need to remind the legs what running is). We set off on the 9th toll of the bells from the local church (and proved once again that, just like at any New Year's Eve gathering, although large groups of people can count, they certainly can't hold good time). 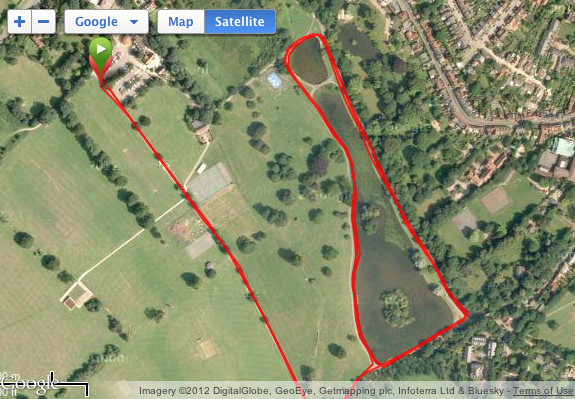 The course runs down a slight incline for 750m or so, round a large pond 3 times, then back up the hill. My first km ticked over in 04:18, well, I thought, it is downhill after all. I had to keep the effort high, so I just thought I'd try holding this pace. 2nd km ticked over in 04:21, nice. I didn't feel too bad either - cadence high, steps light. I'd already reeled in quite a few people who had gone off harder than they could sustain. 3rd km in 04:25 - OK this was starting to look good. I was still holding the pace and cadence well, and felt strong with it. I'd overtaken a few more fast starters too. The 4th km went in 04:22 - great pacing, I was excited now, if I could pull something out of the bag for the final km I might be on for a really good (for me) time. 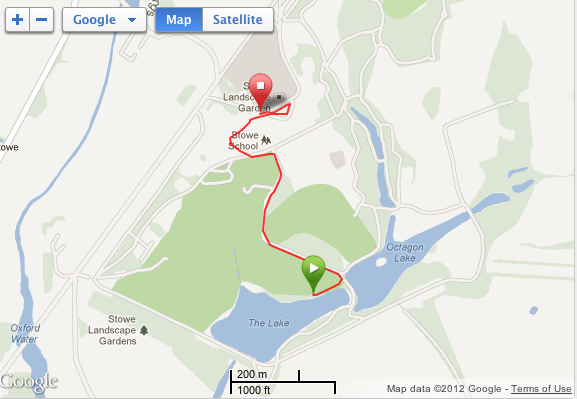 I rounded the corner, gave a push up the short steep part at the start of the finishing incline, and made a big effort. There was a tall man I'd been gradually gaining on the last laps round the pond, I made it a mission to beat him. Digging in I reeled him back, and overtook him with 20m to go - a sprint for the line and it was over. My official time was 21:30 - a massive PB, taking 45s off my previous best! It was also a new PB on (deep breath) age graded performance (61.71%), gender position (15th of 69 males giving 21.74%, absolute position (17th of 122 finishers giving 13.93%), and age category placing (SM35-39, 2nd of 11 giving 18.18%). And now the world knows how needy I am about my parkrun stats. I've got graphs and spreadsheets too - would you like to see? Check out that even pacing! Changed, back on the bike, and off for the ride home - the long way. Legs were understandably fried for the first half hour, but some easy spinning settled them down. I'd decided that the last 10 minutes of every hour were going to be at a hard pace. I was scheduled to be in HR Zone 2, but I can't see my watch when I'm putting a big effort in to see where my heart rate is, so I just decided to "go for it" and see what happened. 0:50:00 came up just as I was turning a 90 degree left hander, I summoned myself to start with the effort and looked up to find a bloody great wall of a hill in front of me! Oh well, better see what I can get done. I put the pedal to the metal for 10 minutes, powering up hills and pushing hard out of the saddle on the flat. I was battered by the end and thankful to sit back down and just spin the wheels. 1:50:00 came round quickly, and I went hard again. No idea if I was putting hard enough (or too hard) an effort in. The route was quite varied. I went through narrow country lanes, up and down steep little hills, and past so many enormous and beautiful houses that I lost count. I thought I would find the last 10 minute effort very hard, but as 02:50:00 came round I gave it everything I had left. 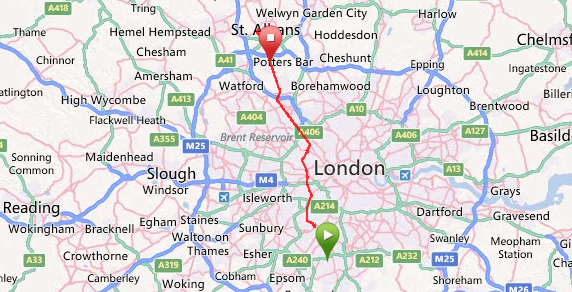 I flew past a couple of surprised London Dynamo riders who had overtaken me earlier, and really kept the pressure on. I was really surprised at how hard I could go even with everything that had come before today. At the end of the third hard push I found myself at the far end of the Thames Turbo Triathlon bike course, so the way home form here was on autopilot. Today was coloured Gold in my training diary - that means it was a breakthrough session. I feel like today I pushed my boundaries and achieved more than I have before. Over 150km of cycling with 30 minutes of real hard effort - and a massive 5km PB in the middle. Training days don't get much more motivating than this. I try to ask myself regularly before/during/after training, and in other relevant decisions in my life, "Will this make me a better Ironman?". Today the answer is yes, today's training will make me a better Ironman. Tomorrow is a double-run day, 45 minutes in the morning, and an hour in the afternoon. Let's see if my legs have forgiven me by then! (I've fed them righteous pizza, so they can't be too stroppy about it). The On Your Marks Events Stowe Olympic Triathlon is another of the important "preparing for Ironman" races that Mrs and I have had on the calendar since last year. We wanted to do at least one sprint and one olympic before the first half IM. We've been hard at it, working and training, so I decided to get us a nice place to stay near the race for Saturday night. Hartwell House Hotel was a beautiful building with a quirky interior. We had tea and scones in the afternoon (more lard-loading than carb-loading), and then dined on over-priced steak. The TV in the room had a stand-by light so bright we cast a shadow on the headboard. I stuck a piece of card over it. The night-porter misread my breakfast instructions, so we got forgotten about in the morning; and on checkout the receptionist was quite short with Mrs. I hope our visit was atypical, but I wouldn't recommend it. A hard afternoon spent "lard-loading"
We got to Stowe in good time to get ready. This weekend was all about the country houses. Registration was in "The Marble Room", and transition was set up out front. We racked up, and headed on the long walk down to the lake. Registration in "The Marble Room"
For once, we were allowed in the water a good period of time before the swim, so I warmed up for about 10 minutes. When we set off I had my usual 5 minutes of panic - however I learned what triggers it. It seems to be as soon as I get the cold water in my nose. I immediately fight for breath, lift my head out of the water, and lose all form or pace for about 5 minutes. I'll need to work on that. 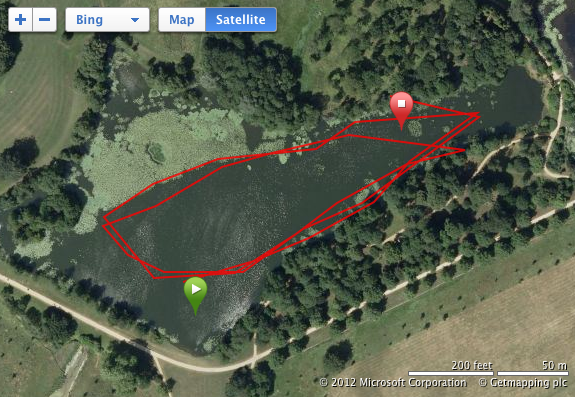 Open water swim GPS plot from my new Garmin 910XT - awesome stuff! I started at the front but everyone swam away from me. After 5 minutes or so I started getting control back, and began to swim more strongly. My form improved over the next 15 minutes and I reeled in the second group and swam right through them, to exit in between the front and second groups. I think my swim could be good, but I need to fix the start. It's happened in every single open water event do far. A "feature" of this course is the 800m run from Swim Exit to T1. My HR went through the roof to start with, and running up was hard. I thought the run was supposed to be at the end? T1 was uneventful, and I set out on the bike course. It was a rolling course, one or two hills that needed the small ring - glad I fitted my front derailleur on Friday night (it worked perfectly). I reeled in a couple of fast-swim slow-bike competitors quickly, and picked off 3 or 4 more round the course. It was fairly quick - I could have gone faster if I'd have been more familiar with the corners. This shows the value of good reconnaissance. A few bits of blustery wind as we went through Silverstone, but other than that it was a solitary and uneventful ride in the sun. I made a last minute decision to tape a couple of gels to my top tube. The tape held the tab firmly so I could pull the gel off and open it at the same time. Despite the worthwhile principle of "never trying anything new in a race" (or "TEST IT", Try Everything Several Times In Training), it worked perfectly. Not going to make a habit of this behaviour though. T2 was quick, well under a minute, and out on the run. My aim for the day was to feel strong in the run. In the two olympic distance triathlons I've completed before I've suffered from some discomfort due to trapped wind (I suspect from taking in air into my gut on the swim), and general knackeredness. I set off relatively well clocking in at about 5 minutes per kilometre - that was around my target pace. However the course was very twisty with lots of 90-degree turns and some even more acute. The terrain was uneven and there were many ups and downs. For a great 5-10 minutes I had a few guys running along with me who had caught my on the run but couldn't find the pace to break past - it felt like a real race! They soon overtook me though and disappeared. I felt like I was putting in a better run than I have before though - I didn't have the usual stream of guys running past me like I was stood still. I found it hard going at the end, but overall I'm pleased. I held in or around 5min/km all the way through, didn't have any internal distresses, and managed a fast-jog finish if not quite a sprint. All things considered, this was a good day out. My time was about 10 minutes faster than I thought it was going to be, and it was good pre-Wimbleball experience to race on a course that actually had some hills in it - particularly the run. I winged it a bit on equipment and preparedness, but won't be taking those risks again, particularly for the long-course events. Drove home via some M40 services for Cheese and Marmite sandwich, Cheesecake, and "Grande Skinny Caramel Macchiato" (Mrs recommended it, I'm not sure I know what any of those words mean) and it was a lovely refuelling experience. Got home and ate Pizza. Yum. I took a trip to Preston on Saturday to support their inaugural parkrun event - I wrote it up on @parkrunfan's blog - check it out here. I want to be the best Ironman I can be. I've been thinking a fair bit about preparation for my Ironman races and how to make sure that my training and equipment are up to spec, and that I'm in the right place mentally as the big day draws near. I've done more training than I've ever done in my life this year, but I'm finding it hard to visualise the change from training weeks to race day. I find myself thinking "Wow, only 5 weeks to Wimbleball!" (only with more naughty words), and apart from knowing that I should taper in the last week or two I don't have a plan for this period. I know there's more to think about than just training, and I am also aware that with busy work weeks (as they all invariably are) the time just flies by. I don't want last-minute-itis to be a feature of any of my Ironman races this year. I'm a sucker for doing these things too late - like most people, I wing it a lot more than I'd like to admit to anyone including myself. For example, I'm racing Stowe Olympic distance triathlon tomorrow and I know my bike isn't in tip-top shape mechanically, I know that if I get a puncture I'm basically screwed as I can't get any of my hand-pumps into the valve recess on my race wheels, I only put my front derailleur back on last night and only tested it by cycling to the end of the road and back! Add to that, I haven't read the race pack, and I don't know how hilly the bike course is, plus I'm spending most of today on a train, and you'll see that I'm fairly unprepared. I definitely can't be doing this for the big races. When I went to Wimbleball a couple of weeks ago I ended up packing almost every bit of triathlon kit I own - far too much stuff! I didn't know what the weather was going to be like, I didn't check, and I didn't have a plan. I've decided to split the 4 weeks out from race day into two fortnight periods, and use them to make sure I'm ready. I've named them, and put them in my calendar. Therefore, it's with great pleasure I introduce "The preparation zone" and "The focus zone" (I know the names are crap, it doesn't matter!). During these periods there are tasks I want to complete, decisions to be made, and behaviours to encourage (or discourage!). Try to get as much sorted out int he 2-4 week period as possible, and then by the time race day comes the number of decisions to be made should be virtually zero, leaving all mental strength to remembering and following the race strategy. From what I've heard so far, by the time you get 30km through an Ironman marathon you can barely remember your name, never mind make reasoned and logical decisions! I'm sure this list will evolve over time, but here's my starter for ten. Simulate race day nutrition - any GI distress? Make course-specific decisions - bike/wheels, bike gearing, run shoes? Confirm travel and accommodation (tickets, reservations, any associated paperwork) - print out confirmations and phone ahead to confirm bookings, if i'm driving are there any special instructions for parking? Write down the itinerary for the weekend - where do I have to be, and when? Include travel, departure and arrival times, registration, compulsory briefings, getting up time, bed time, etc. Download and discuss the bike course and run course routes - will there be the opportunity to ride or run the course ahead of the race? Check there's a plan for the cats! Download and save the bike and run courses onto Garmin Connect and my GPS. What's the weather forecast - which weather-coping plan is looking likely? Verify kit as soon as I reach the destination - while there's still time to buy any emergency last minute items! Based on weather, which race day plan is looking likely? If I get this right, it won't seem like long before I'm crossing the line, and hearing Mike Reilly and his immortal words… "You! Are! An! Ironmaaaaaaaaaaaaaannnn!" (I met him at IM Wales last year in our hotel bar, I didn't realise he was such a legend!). Thames Turbo race days involve Very Early Starts. Today's was a Very Early Start Indeed, as the first competitor was going to set off at 06:30 instead of the usual 07:00. This meant Race Briefing at about 06:25, and so even though we'd made the trip to the pool yesterday evening to register we still needed to get there for 06:00 to rack up and get ready. I have decided this year to cycle there rather than drive to get a warmup in. Therefore we were leaving the house at 05:20 for the 14km ride, and that meant getting up at 04:30! In my book, that's a Very Early Start Indeed. It was cold, but dry. There had been some showers over night, but apart from the odd puddle you'd have been hard pressed to tell. Thankfully not a repeat of the rain-fest that was Race 1. We arrived and racked up without incident. I didn't see the exact time the first swimmer went off, but it seemed like they stuck to the planned 06:30 kick-off. I was bib 227 so I had a fair time to wait. I cheered Mrs as she started a few minutes ahead of me as bib 195. Her estimated swim time is faster than mine, so she goes off before me. You can check out her race report here. I followed my Race Strategy well. I'd eaten according to plan, and warmed up before the swim (a bit early, there was a wave break after the 174th person and that meant I was all but cooled down again by the time my start came). I'd set up my new Garmin Forerunner 910XT, but decided to leave it on "Other" sport for the duration of the race - I didn't want to be fiddling about telling it when I'd changed sports whilst trying to race. Maybe next time when I can do it without thinking. I set off well, not as well as I'd like, but certainly better than the thrashing about of Race 1. The swim felt faster than last time, so I was a bit disappointed to see I was only 3 seconds quicker over the 432m. Still, it's a PB swim time, and I can't complain about that. I think to get better in the swim I need to go out to the pool and become more familiar with it (as well as "get better at swimming", of course). T1 was 3 seconds quicker at 00:57 versus 01:00 in Race 1, I expected more as it was warmer and not raining, but any quicker is still quicker. It took a bit of gaffing to get my feet in my shoes on the bike, but once in I shot down to the first corner (as per Race Strategy). I can definitely say I went for it on the bike. I pushed hard the whole way, focussing on the next section and the next person ahead. As there were 226 people in front of me, and my bike is strong, I caught lots of people. I enjoy seeing someone on the horizon and reeling them in, I find it helps me keep putting the power down. I caught Mrs with about 500m to go - I was giving it my all for a strong finish. It turns out I was the only person who overtook her - she was having a storming race! I used almost a bit too much of the 7 minute non-compete zone - I worked out afterwards I'd used 06:56 of it! It was a nice breather though, and really nice to cycle back up to the pool with Mrs who finished just a few seconds behind me. T2 was uneventful - again, quicker than in Race 1 at 00:49 as opposed to 01:06. I think there's time to be saved here though, I shall make a note to practice the transitions, as I never have done. I ran according to plan too. Found my legs in the first km, wound it up a bit, tried to hold the pace (with some success) and just focussed on ticking the kilometre markers off. At only 5km you can put some effort in, but it's still long enough to end up blowing up if you go out too hard. I summoned up my strength for the last 500m and pushed hard for the final corner. As I turned it I sensed someone else behind me, and we both opened up and flat out sprinted the last 100m to the finish line. My Garmin says I hit 21.1km per hour! I held out by the way, beating him by what felt like just hundredths of a second. It turns out he was bib 226, so overall I'd beaten him by 10 seconds - that sprint was definitely worth it. I bought my new watch in order to get heart rate data during the race - the Polar RS300X sports watch I wore previously whilst swimming (and therefore racing triathlons) doesn't provide a plot, just average and maximum. My first trip out with the Garmin was a resounding success - after only the briefest of configurations I got a great plot. From this I can see that I work hard on the bike, but have a lot more to give in both the swim and the run (in heart rate terms, at least). I'd followed my Race Strategy well, and I'd given it a really big effort. I can definitely say I was trying hard. My time overall was 01:08:35, just 12 seconds slower than the last race. This says two things to me, firstly that my performance in race 1, in the freezing cold and rain, was far better than I'd realised at the time; and secondly that the training load this week had hit me and I wasn't fresh - I've run 4 of the last 5 days, and cycled 120km home from Northampton parkrun on Saturday (2 days ago). I cycled home (very) slowly with Mrs who had also put a monumental effort in, and waited for the results to be published. Mrs looking justifiably super-happy at smashing her PB by a phenomenal 3 minutes and 31 seconds! This is by far the strongest set of results I've ever had, and I'm absolutely overjoyed about it! I've got a lot to waffle on about the analysis I do on the results (the run and swim stats are not quite so impressive! ), and where I place relative to those around me, but I'll save that for another day (there will be lots of interesting graphs, I promise). I feel thoroughly justified for stuffing my face the second I'd got home and got cleaned up. 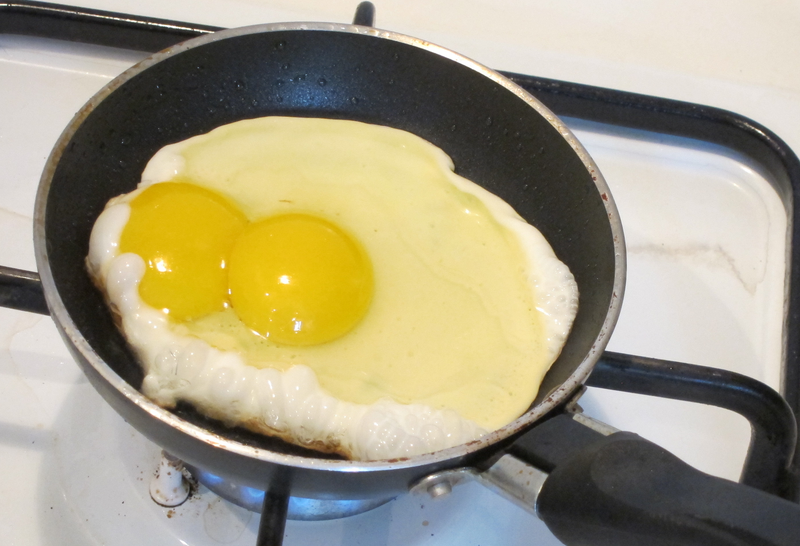 To make the day even more special, I had a double-yolked egg!! The full Garmin log of the race is here. I realised today I have never had a strategy for the Thames Turbo Sprint races, despite tomorrow being the 10th one I've entered. For the big races I'll have a list of things to take, a timetable, etc - no need to go to that extent here, but I should think about what I want to achieve. The key with a race strategy is that a target time in of itself is not a strategy. I've gone into previous races with "I want to get below a certain time", but not with anything in my head about how to achieve that other than "be faster". Not even how I was going to try and be faster. Time is not a strategy - the good finishing time is the reward for delivering the strategy. So, here is my lightweight my-first-race-strategy approach to tomorrow. Let's see if it pays off! Before starting: Get properly warmed up. I'm cycling to the event, so that will be a good start, but then I'm 227th on the start line, so there's a minimum of 227 x10 seconds = 37 minutes and 50 seconds until I set off. That's plenty of time to end up very cold. Keep warm clothes on until the last minute, don't stand around in tri-suit shivering. 10 minutes before my start perform some warmups - squats, high-knee running, shoulder rotation. In the queue visualise the swim start and first length - I lost form instantly last time and I think it cost me a considerable amount of time, let's not do that again. Think about the catch, strong powerful pull through to the end of the stroke, and a high controlled recovery - keeping long and relaxed. Make sure watch is set to the right mode and ready to go. Make sure bike shoes and run shoes are talcum-powdered. The Swim: I haven't been focussed enough and planned my swim. Keep form right from the start. Don't panic. Put a good amount of effort in and focus on every stroke generating power. Avoid dead spot that I have a tendency for (I'm definitely an overglider). Wind up the power form length 4 - I've never tried to go fast in the swim, always to "get through it". This is a sprint, let's burn a match and try sprinting. Don't faff about touching the end on the last length - get out quickly. Brisk pace getting to my bike, get breathing under control. Follow the visualised T1 routine - Race belt, Helmet, Glasses. Brisk pace to the mount line, every second counts. The Bike: My bike times are good compared to those around me so it's easy to get complacent. It's not that I don't put effort in, but I don't push it that extra mile. There's a 7-minute non-compete zone in-between the bike and run, so I can burn some more matches and have a few minutes to recover. Start fast - don't idle down to the first turn, can definitely make time here. Get breathing and rhythm settled on the 1.5km to first roundabout, be ready to push it on the way back. Push hard from the roundabout, and focus on the far turn - it's only 10km. After far turn, burn a match and really push for the village. After village there's the smooth sewerage works road to come, last 1-2km, give it everything. T2: Again, transitions normally good, so more of the same. Use the 7-minute non-compete zone to gather breath and visualise T2 and run start. Run over the timing mat, don't start after it. Brisk pace out of T2. The Run: My run is much better this year, but again lacks strategy. Get a good high cadence start down to the park gate - don't worry about speed yet, feel my legs and settle in. In the park focus on getting holding a good pace and cadence. Take the most direct routes across to the turn, straight lines apex to apex. Give a push from the corner down to the feed station. Hold pace round the rest of the first lap. Focus mentally on the final 1-1.5km. Push again down to the feed station, and hold it across the trail section to the grassy bit. Work to hold the pace across the grass. As soon as I get to the path, empty the tanks and give it everything right to the final corner. After the corner, sprint for the line. Nutrition: Worked well last time - historically I've eaten too much but the last race felt good. Same again, please. Porridge and a cup of tea before we leave. Nothing else apart form sipping a carb drink before the race. No need for food or drink during the race. 90g Recovery XS with 450ml skimmed milk as soon as possible after finishing. That's the strategy. I don't know if it's too much or too little to remember, I haven't tried this before.